I was ordained in 2002 and have been designing, writing and performing wedding and commitment ceremonies for couples since 2005. 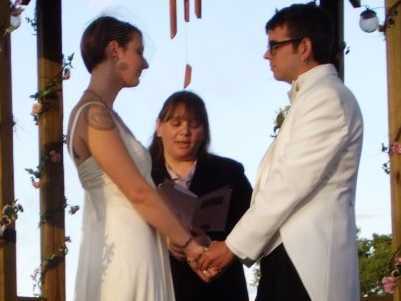 For nearly 10 years I served as a wedding officiant and I’ve had the honor of presiding over close to 300 ceremonies as of the end of 2018. On 8/8/08 they were clients, but ever since they’ve been my friends. At this time, I’m not pursuing couples anymore. However, if you’re looking for my services, I am still available. I tend to be hanging around Holly, MI and the Michigan Renaissance Festival on weekends from mid-August through September, but I’m always delighted to help couples design the exact ceremony they want. I think there are still some reviews of my work here on the Wedding Wire website, but the link is getting a little old now. I’ve learned a lot about the ins and outs of weddings over the years. Feel free to contact me and ask any questions you have. I’m here to help!